The tradition of Veshas or disguises comes alive every year during Dassehra celebrations in Mangalore, Karnataka. 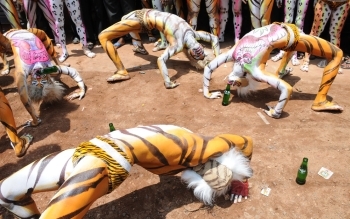 The Pili Vesha or the tiger dance, where men in groups of 5 to 15 paint their entire bodies in tiger stripes and perform a unique dance, is the most popular event during the celebrations. The leader of each group is called the Shardoola, and he wears a unique head gear and dances to rhythmic beats, as the rest of his group follows his steps. These men perform various kinds of dances but the most popular one is Kuri Haakunu. 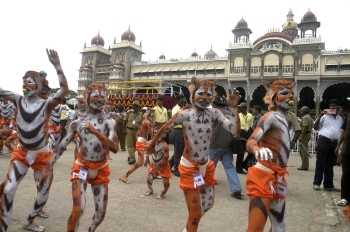 The dance performance, depicting a tiger hunting for a sheep, was an instant hit with the audience. The Pili Vesha is performed only twice in Dakshin Kannada -- during Dassehra and during Janmashtami celebrations. Earlier, the Pili Vesha used to stretch on for ten days. The dancers spend hours painting their bodies and sleep only on plantain leaves to prevent the paint from peeling off. The dancers in groups go from door-to-door to collect money. They receive anything between Rs 25 to Rs 100 per group.